The Fairways at Mauna Lani is a luxury, gated community with million dollar plus town homes and resort style amenities, located in the prestigious Mauna Lani Resort along the Kohala Coast of Hawaii's Big Island. 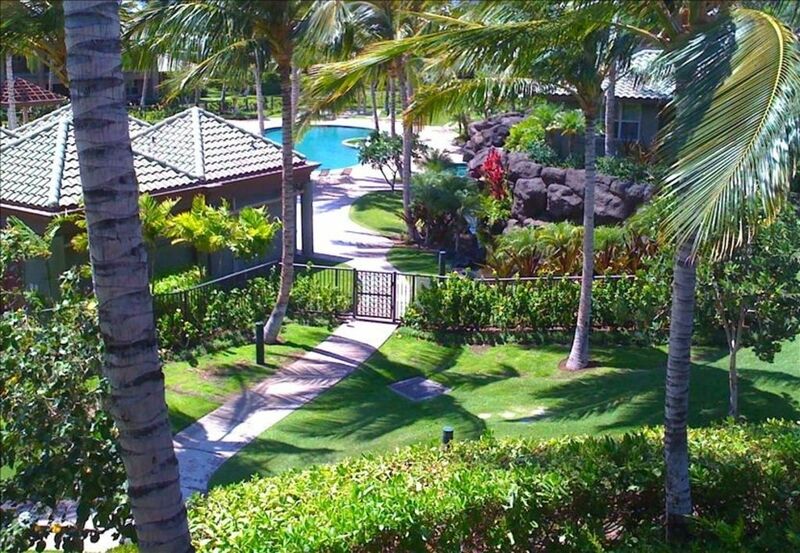 Enjoy views of Mauna Kea, Kohala Mountains, lava fields, swaying palm trees and just a short walk to the beach. These town homes are the perfect place to enjoy your vacation! This luxury residence property is located directly in-between two world-class resorts: the Mauna Lani and the Fairmont Orchid. Each of these resorts is perched on one of the most beautiful beaches in the world: The Mauna Lani Beach, replete with white sand, clear blue waters, and the best weather Mother Nature can offer. These town homes boast granite counter tops and the finest finishes. Did I mention the barbecue on each lanai? The Guest Pool area has barbecues and a shady area to sit and enjoy a good book! Each unit has washer/dryer and stainless steel appliances. You can practice your swing at the two championship golf courses, or work on your tan at the beach. Lots to do for the whole family! Enjoy premier dining at the Tommy Bahama restaurant, or shop for souvenirs at the gift shops. There will, of course, be a Starbucks and even a Blockbuster Video store! Not to mention all the great upscale shopping and other restaurants to choose from. Fun for everyone! Please inquire directly for availability. Please view our other properties! Hello! Thanks for taking a look at my properties! I'm an avid traveler, and a self-employed entrepreneur. My wife and I call the Big Island of Hawaii home for half the year, and the other time we travel between Montana, or wherever our heart desires. We enjoy spending time with our family and friends, especially when sharing a beautiful Hawaiian sunset! We have 5 properties on the Big Island and we're seasoned hosts - having done this over a decade. Our property numbers are: 11826, 26201, 210469, 206890, and 848068. Hope you choose to stay with us! I bought here as I wanted to be close to the beach, golf, shopping, restaurants and a 5 star resort. Golfing, Beaching, Swimming, Snorkeling, Diving, Shopping, Dining, Great Walks on the Beach, the list is endless!!! We had a wonderful holiday at this well appointed condo. Dennis was very communicative and responsive. The condo is beautiful and relaxing and in a great location. I would love to return! Beautiful and spacious. Dennis is responsive and helpful. Close to grocery store, shopping and golf. The beach is a mile away, but beautiful. Nice unit. We thoroughly enjoyed our stay. Unit was well equipped and had all the items we needed to just relax and enjoy Mauna Lani. We could not have more positive things to say about this property. Check in was smooth and effortless, the owner provided detailed instructions that covered everything we needed to know. There was nothing that we needed in terms of cooking in the kitchen that was not provided. Everything was anticipated, and the owner checked in with us frequently to make certain that there was nothing that was needed. This was particularly important as we were there when Hurricane Lane hit the island, however all of the activity was on the Hilo side of the island, just light rain on the Kona side. The pool was great, and the Beach Club access was amazing, with great snorkeling right in the small bay at the club. We highly recommend staying at this wonderful unit. I’ve visited Oahu several times before, but this was my first time to the Big Island and with no regrets I can say it was an amazing time my wife and I had with our friends at Dennis’ property. He had been very responsive, promptly answering our questions from beginning till the end of our stay. I mean, the house is gorgeous - and it has everything that you need... I can’t even describe so many features and amenities that this place can provide... you name it! And let’s not forget to mention the pool and jacuzzi... terrific! I definitely recommend this place... I’m positively sure you will have a pleasant experience working with Dennis! We had a great experience staying here. Easy access to the community and the condo. Beautiful location with nice pool area. Condo was clean, very comfortable, and perfect for our family of 5. Well-stocked kitchen and laundry room, had everything we needed. Dennis was a pleasure to work with and very responsive. Great location for day trips. Would definitely stay here again.